Review posted July 19, 2015. Listening Library, 2014. 9.5 hours on 8 CDs. The Scandalous Sisterhood of Prickwillow Place are the students at a girls' Victorian boarding school in Ely, England, St. Etheldreda's School for Young Ladies. Right at the start of the book, the girls' awful headmistress suddenly dies, as does her odious brother. The girls don't want to be sent home! Smooth Kitty forms a plan. They will carry on as if nothing has happened. Stout Alice is an aspiring actress, so she can impersonate Mrs. Plackett when visitors come to the door. Pocked Louise is a budding scientist, so she can determine if poison was used. Dour Eleanor can be in charge of burying the bodies in the vegetable garden, and Disgraceful Mary Jane can distract any men who come around. Dear Roberta and Dull Martha have parts to play as well. There's one problem: What will the murderer do if their plan didn't work the first time? Will they be convinced Stout Alice is in fact Mrs. Plackett and try again to kill her? This is a delightful book about girls caught in a difficult situation who come up with questionable ideas for dealing with it. I enjoyed the atmosphere of Ely with the cathedral looming, as I have been there and that's what I remember. Naturally enough, it reminded me of Summer of the Gypsy Moths in that both books begin with girls burying a body and trying to convince others that nothing has happened. 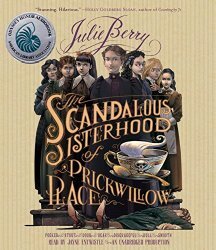 The Sisters of Prickwillow Place have the advantage of there being seven of them. Can they work together to be able to stay together? This is a murder mystery with a Victorian atmosphere. I listened to the book, and the narrator is wonderful, using a distinct voice for each character, and all with an English accent which of course makes for delightful listening. The trailer is wonderful and gives you the flavor of the book.